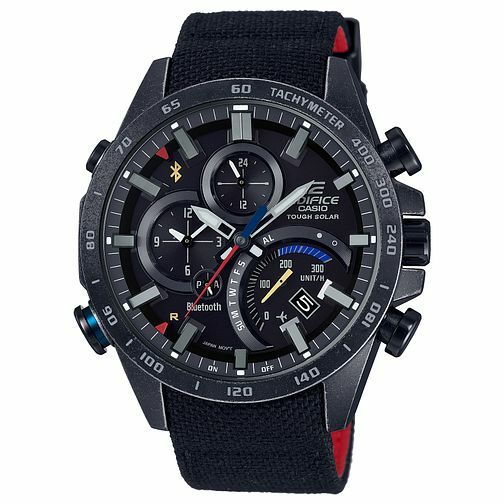 From the Edifice collection by Casio, this classically styled timepiece is designed for durability. Featuring a black stainless steel case and black strap, black face and bezel, scratch-resistant mineral glass, 100m water resistance and an LED light, this bold watch is made to offer both precision and masculine elegance. Casio Edifice Men's Stainless Steel Strap Watch is rated 2.0 out of 5 by 1. Rated 2 out of 5 by Anonymous from Very small dials Very difficult to read all the very small dials on the watch face and the date. Has Torro Russo written on the clasp which not depicted on the picture on the website.